We all love the aroma from the cake when we bake it, as it fill the house, some of us will close their eyes and imagine what the taste of the cake will be like. The sweet smell always bring everyone a good memory too. For me, I like to take a deep breath while baking, the homey smell give me a sense of comfort and peace. 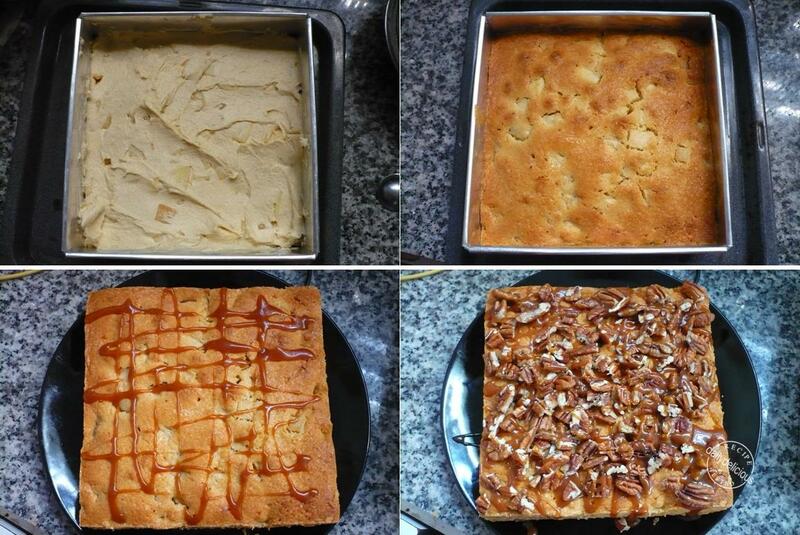 So, baking at home is the best thing for me ^ ^. The most delicious smell that I like is anything with the apple and cinnamon, I think it's the most homey aroma in the world, haha. 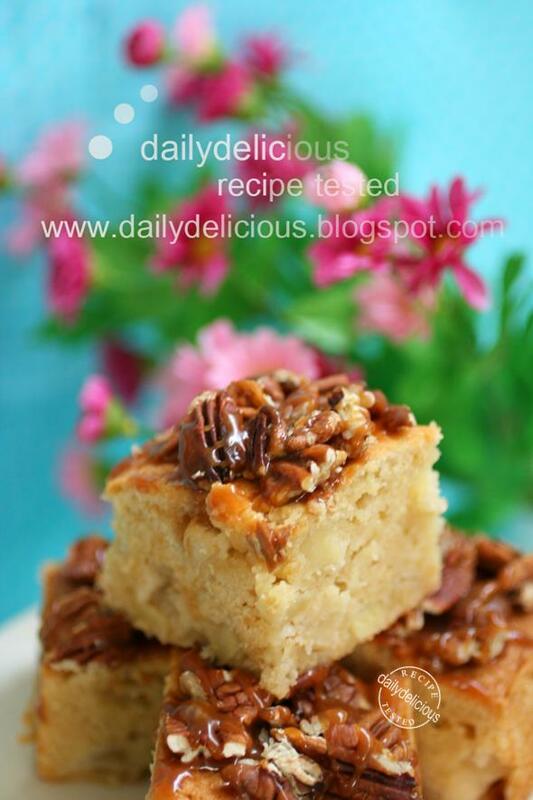 This cake is very easy to make and very delicious esp. for anyone who love the caramel (like my sister, she really crazy about caramel, haha, even she doesn't like cinnamon, she still love this recipe). 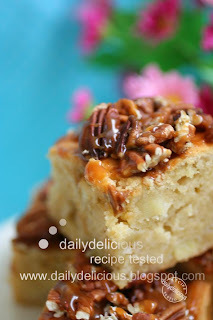 The original recipe uses the soft toffee instead of the caramel sauce, so if you don't want to make the caramel sauce you can use 50g of the soft toffee (use the Werther's chewy toffee) with the 2 tbsp of the double cream. 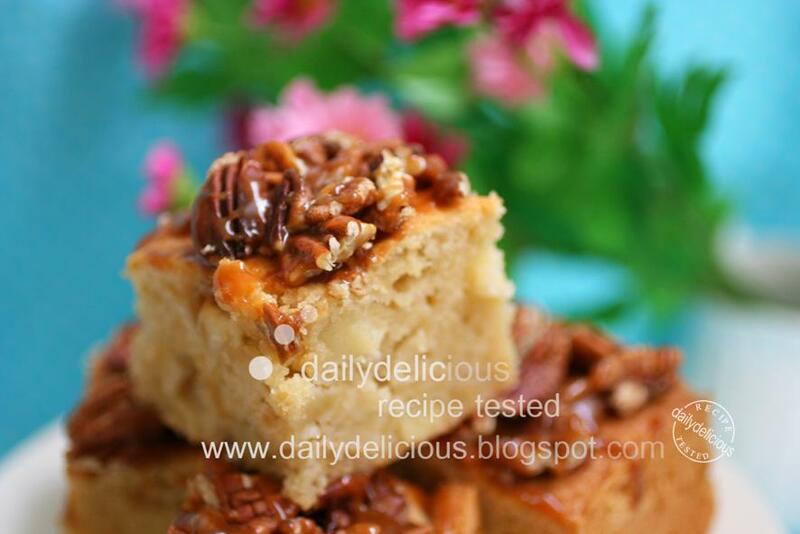 By melting the toffee in the small saucepan with the double cream and use it as a caramel sauce. This method is great for anyone who don't like to play with the hot liquid like the caramel and safer ^ ^. 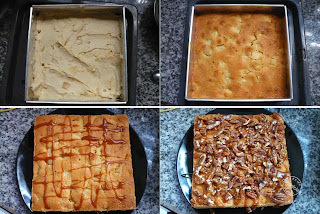 Apple cake can be served as a afternoon tea treat or a great start of the morning, each bite of the cake filled with the soft and sweet cake with the sweet apple which turn into another level of the deliciousness by the taste of the caramel and nut. 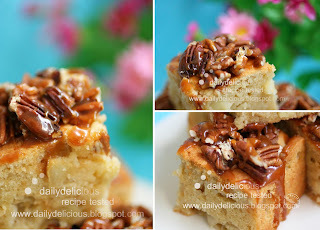 I like to have it warm with a cup of tea, imagine the sweetness of the cake, the little bitterness of pecan, they will make you feel great every time of the day. Sift the flour, baking powder, salt and cinnamon together and set aside. Beat the butter with the sugar and vanilla extract until pale, then beat in the eggs, one by one. Tip in half of the flour mixture, fold to combine, then add the yogurt, fold again. 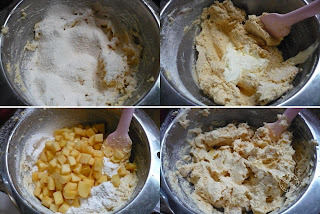 Pour all of the flour and apple then fold to combine. Scrape the mixture into the pan, smooth the top. Bake the cake for 45-50 minutes or until a skewer poked in comes out clean. To decorate, warm the caramel sauce to liquidize it. Drizzle the caramel sauce over the top sprinkle the pecan and drizzle again, then leave to cool. 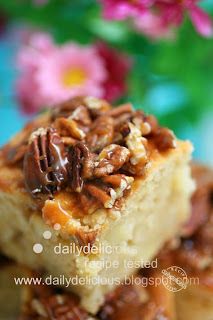 looks wonderful, I'm going to make a batch of caramel sauce right now! do i need to beat the batter again after 'fold to combine' all the ingredient? No, just fold it until combine. Love your recipes! I am very inspired while looking at them, and cannot wait to make everything!